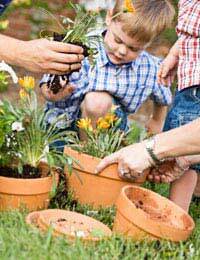 Incorporating a garden into a day nursery can be a rewarding and wonderful additional space for the children. You don’t have to have a huge amount of space – even a few plant pots on a windowsill can be a garden and still teach children about the wonder of planting something. However, some nurseries have excelled in creating a space that inspires and extends children’s learning on many different levels. One such example is a Montessori day nursery in the north of England. Here they tell their own story. "We set up our garden because it was a lasting reminder of our Montessori centenary celebrations - I guess the idea of it was to create something that could continue to be built upon in the coming years and at the same time it had to be a working garden for the children. "The ideas came from various people including the children, staff and parents although it was quite tough to get all the staff on board, as it meant an awful lot of work. We designed it ourselves around the needs of our children because we didn’t just want a garden that looked nice but it had to be something that would be workable for the children. "It’s been designed as a pleasurable space in which the children can explore, touch, observe, and learn about the natural world. Many of the garden features were selected to enhance and inspire movement and so we used balancing beams, stepping stones, and a bridge which helps their confidence and coordination. "We also had to consider the needs of our very youngest children and their needs to explore the garden safely, we fully believe that the babies should be able to roam around the garden freely so we had to choose the planting carefully and think about textures and smells for them. "Keeping the garden in a good state of repair was also a consideration for us, and for this reason we chose low maintenance planting schemes. "The children were involved in all stages of its construction, and they kept a diary of its progress. We wanted a garden that had elements to stimulate all the senses – touch, taste, smell, sight, and sound - and that encompassed all areas of learning, such as growing vegetables and herbs that can then be used in tasting and cooking sessions. "As I have already said it is an ongoing project - I don’t really think you ever stop making changes; some things turn out not to work or are not practical for small children, so you are constantly evaluating and re-evaluating. "The garden is now more like a learning environment in that the children have the freedom to choose what they work on and know where everything is kept and can maintain it relatively well. "I think it’s made a huge difference to way that the staff view the outdoors and the children are getting so much more from it. The Best Thing"The best thing for me, is a giant magnifying glass set into a wooden post in the ground, the children can take anything from around the garden and look at it in closer detail – its fabulous!"